UPDATED: Sat., Feb. 2, 2019, 5:08 p.m.
Gov. Jay Inlsee set aside $6 million of the state budget to look at recycling issues, and if passed, the bill would annually take $1.9 million of that. Local governments would be required to create a plan to minimize contamination in recycling and as well as to inform residents what goes into the recycling and what stays out. Most already do, said Paul Jewell, policy directory for the Washington State Association of Counties, a group that is negotiating with the Department of Ecology on easing the burden for smaller governments. 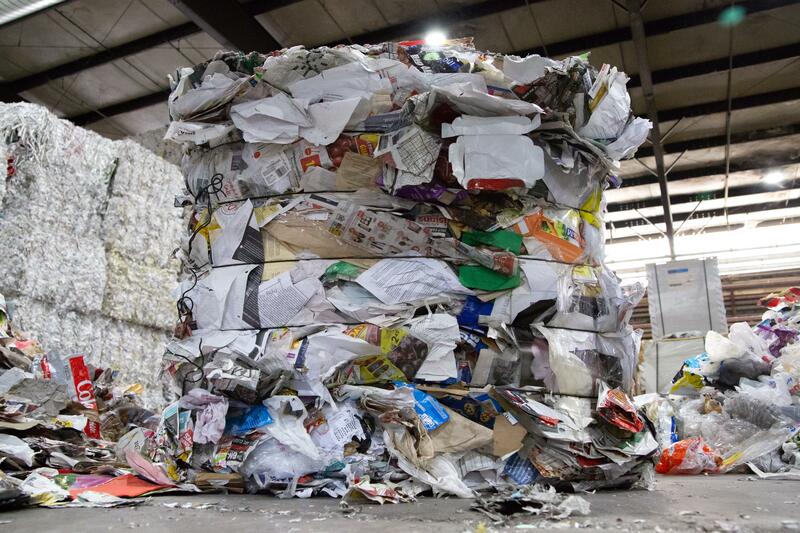 But if local agencies aren’t able to spend the resources to make the plans themselves, they could adopt a statewide recycling plan that the bill will create, said Laurie Davies, environmental program manager for the Washington Department of Ecology. Leanne Hawley, Solid Waste Coordinator for Ferry County, runs a three-person recycling operation for the county. A few years ago, Ferry County started doing its recycling instead of giving it away to a private company. Hawley and her two coworkers take turns sorting the single-stream recycling by hand. Hawley already has a plan to inform and label what is considered a contaminate, but she’s unsure what the Department of Ecology would require to be met for approval, or what the state outreach plan would look like if she had to adopt it – the state plan would be created at a later date if the bill is passed. She’s not sure sure how the bill would affect her new operation, but any extra work will hold back the new program, which recycled 13.1 tons last year, she said. “As far as dedicating time to revamp all that stuff, that would take a lot,” Hawley said. Davies said she doesn’t think the bill will affect smaller communities because their lists of accepted recycled materials are small and there are not markets to tap into for more obscure materials, unlike larger communities like Seattle. “It’s going to be more of a workload for bigger counties,” Davies said. Governments don’t have to disclose what they consider contaminates, so when residents recycle garbage, the private collections companies bear the burden of separating trash out of the recycling. Residents are unclear what is and isn’t recycling – plaguing the recycling markets with dirty recyclables. The policy board, for example, would help with finding a way for recycled milk cartons to be best used after they’ve been recycled. Milk cartons are a troublesome material because paper and plastic are laced together. Separating the materials is costly and inefficient, and it’s not clear how to best do it. “What are the possibilities to use materials in cartons or other marginal recyclable materials?” she said. Twenty percent of the bill’s $1.9 million would allow the center to also provide grant funding. It would help local governments with funding waste reduction and litter control programs. Grants up to $60,000 would be given, according to the bill. Published: Jan. 27, 2019, 4 a.m. Updated: Feb. 2, 2019, 5:08 p.m.